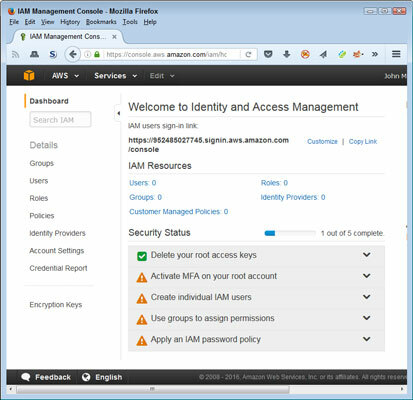 When you initially create your AWS (Amazon Web Services) account, Amazon assigns an identity to the account name and password that you provide as the root user. The root user has unrestricted access to all the AWS resources. As you might imagine, this makes the root user account dangerous, because anyone who gains access to it can also access everything your AWS account supports. Because root user access is so dangerous, Amazon recommends that you use it only to create your first administrative user and then lock the root user access so that no one can use it. The root user never goes away; you simply make it nonfunctional unless you really do need it at some point. To begin this process, you must access the IAM Console. You may see a sign-in page for your account when you aren’t already signed into AWS. Provide your credentials as needed. After you sign in to your account, the page shown ihere appears. Use the IAM Console to perform security-related tasks. Now that you have access to the IAM Console, you can perform the tasks required to create an administrator account and assign it privileges.